The Judicial Performance Commission for the Twentieth Judicial District recommends that Judge Karolyn Moore NOT BE RETAINED by a vote of 6-4. Judge Moore attended the University of Colorado, receiving her undergraduate degree in Political Science in 1988 and her law degree in 1991. From 1991 to 2011 she was a deputy district attorney in the First, Ninth, and Twentieth Judicial Districts in Colorado. She was appointed to the County Court Bench of the 20th Judicial District in January 2011. In Judge Moore’s time on the bench, she spent 13% of her time dealing with civil matters, 11% criminal, 31% misdemeanor, 38% traffic, and 2% small claims. In this process, the Commission considered responses to anonymous surveys sent to attorneys and non-attorneys that appeared in Judge Moore’s courtroom, a self-evaluation, unannounced visits to her courtroom, several of her written opinions, and an interview with Judge Moore. The commission also held a public hearing soliciting further information about all the judges who are standing for retention. Judge Moore’s survey results raised many concerns for the Commission. Among attorneys surveyed about retention, 45% recommended to retain, 40% not to retain, and 15% made no recommendation. Among non-attorneys, 90% recommended to retain, 5% not to retain, and 4% made no recommendation. When compared to all county judges by non-attorneys (including jurors), she received a slightly higher recommendation for retention (90% versus 86%) and was rated slightly higher than judges overall on a number of measures such as demeanor in court. She also received many positive comments from the non-attorneys particularly regarding demeanor and communication skills. On the other hand, she was seen as being biased toward the prosecution and harsh in her sentencing in comparison to other county judges. Judge Moore’s survey ratings by attorneys were very different from the non-attorneys. In all five categories, including all 17 subcategories, attorneys gave Judge Moore lower ratings when compared with all county judges. The categories include case management, application and knowledge of law, communications, demeanor, and diligence. Her overall score among attorneys was much lower than the average for all county judges – 2.51 compared to 3.29. Judge Moore was seen as being very biased in favor of the prosecution by 46% of the attorneys while on average all county judges were so rated by only 10% of attorneys. She was also perceived as being somewhat biased in favor of the prosecution by a higher percentage – 33% compared to 25%. The surveys provided similarly negative results for Judge Moore regarding a recommendation for retention. The same sampling methodology was used to survey attorneys and non-attorneys for all nine judges standing for retention. Judge Moore’s survey results were substantially more concerning than any of the other judges reviewed by this commission. Although she received positive comments from some attorneys, there were many explicit comments detailing concerns attorneys had with Judge Moore. The Commission is not convinced that Judge Moore fully understands the extent of her shortcomings as a judicial officer. 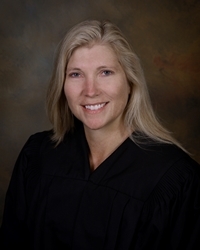 Judge Karolyn Moore’s Response: I’m honored to serve the people of Boulder County. As a new judge, I’m focused on improving my judicial skills and initiated an improvement plan with my chief judge. Among the attorneys surveyed regarding my performance 93 criminal defense attorneys and 19 civil attorneys responded. I value their comments, however the surveys were not sent to prosecuting attorneys and other important voices were not heard, leading to imbalanced results. I strive to be fair and impartial to every litigant, while being respectful and maintaining proper courtroom decorum. These qualities are reflected in the non-attorney survey results, which overwhelmingly support retention.